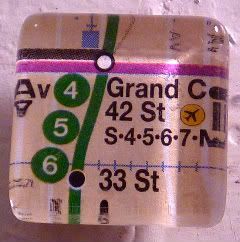 This little tile magnet is one of a really cool MTA map set that I picked up from the Transit Museum Annex at Grand Central Terminal. The MTA has revamped our subway transit map, set to be released next month. It's like the first time in several years they've redone it, but it kinda makes me crazy. I mean, it's not like they're renaming subway lines, or making superdupermajor changes to it. (Unless you're from Staten Island, in which case I have to wonder how ya'll feel about being shrunk superdupersmall.) And, at least they're making big announcements about it. When they dumped the 9 line, I was like the last person to hear about it. I didn't even notice they'd eliminated the line until months later. And that's one of my major lines! So, yeah, when I actually notice it, I get a little unnerved by change. I should be getting used to it, given the year I've had. I dunno. All I keep hearing change is good, and I've yet to see how that's truly the case. But who knows, maybe this map will keep me from getting on the wrong lines - I'm still always the one who has to double-check my lines when I'm headed to Queens or Brooklyn...otherwise, I head to both.